MainAll NewsDefense/Middle EastArab Fund for PA Independence? Arab Fund for PA Independence? Two private Arab investment firms are planning to lay the groundwork to help fund the PA's declaration of independence in two years. A private PA equity fund is being planned by Dubai and Saudi Arabian companies with the aim of laying the groundwork for funding of a future unilateral declaration of independence by the Palestinian Authority. 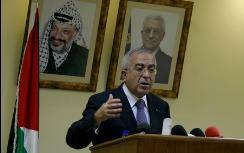 The announcement, made Sunday in Ramallah, comes in the wake of statements by PA Prime Minister Salam Fayyad that he intends to announce the establishment of a new PA country regardless of the status of talks with Israel. Fayyad has said he will move ahead to establish financial institutions and other economic infrastructure towards that goal. According to the Associated Press, the semi-official Saudi-based Palestine Investment Fund, and the Dubai-based private equity firm Abraaj Capital will invest in small and medium-sized businesses in the PA. The target funding level for the first year will be $50 million by the end of 2010, with an initial investment of $15 million.